Curious Matter is announcing its new Call For Entries, "Naming The Animals." If you believe that this will be of interest to your artist members, please make it available to them. Thank you for your cooperation. We're absolutely delighted to announce this special collaboration between CURIOUS MATTER and PROTEUS GOWANUS. Details are below and attached as a pdf file. Cheers! Naming The Animals is a collaboration between Curious Matter in Jersey City, NJ and Proteus Gowanus in Brooklyn, NY. The exhibition will be presented in two parts concurrently at Curious Matter and Proteus Gowanus. The curators will select the location for the artwork. The exhibition is a complement to the yearlong multi-disciplinary inquiry hosted by Proteus Gowanus on the theme of Paradise. A catalogue will accompany the exhibition. Theme: In our collective effort to understand the world we're driven to catalogue and name everything around us. From Adam’s task to name the animals in paradise, to cave painting to modern ecology and zoology, we’re compelled to describe and render the creatures that share our planet. Medieval bestiaries, and the work of Ernst Haeckel and John James Audubon are vivid examples, as are the installations of Mark Dion and the ecological works of Alexis Rockman. These various efforts are not necessarily purely aesthetic or scientific; naming and cataloguing can also include the assignment of moral or metaphorical associations–implicit is the desire to declare and understand ourselves. We invite contemporary artists to submit work that draws inspiration from the natural world and the human drive to understand and catalogue the world around us. We're taking a broad approach to the theme and are particularly interested in work that looks beyond a literal interpretation. Media/dimensions: All media will be considered. Artworks should not exceed 24"(framed) in any direction for wall hung work. Small sculptural work and bookarts particularly welcome, larger sculptures will be considered individually. Video artists must provide their own equipment. Eligibility: All artists working in any media. 1. Up to 5 images. Postal submissions should include 35mm slides or letter-sized color printouts. Do not send original artwork. Digital file submissions will only be accepted via email and must be in JPEG or PDF format, resolution set to 72 dpi, no larger than 800 X 800 pixels and no larger than 2MB. Please number images to correspond to Image List. 2. Image list. Numbered to correspond with your image submissions. Include image #, your name, title, date of work, medium, size and price. You may include a brief description for each image, however this isn’t required. contact information and an email address. 4. Artist’s statement. No longer than 300 words. Fees: NO FEE TO ENTER, accepted artists pay a nominal materials fee of $35. Deadline: Entries must be received no later than March 4, 2011. Return of Submission Materials: Include a SASE if you want your materials to be returned. Make sure there is sufficient postage. Materials without postage will not be returned. Notification: Accepted artists will be notified via email by March 7, 2011. NOTE: Accepted artists must confirm their participation by March 8 and provide a print-quality digital image for the catalogue by March 11. Drop Off: Drop off of accepted artwork will be March 26 and 27, noon to 2pm at Curious Matter. Mailed artwork must arrive by March 25 and include return shipping label/postage/etc. Pick Up: Artists are responsible for picking up artwork on May 21 noon to 2pm. Return of mailed artwork with return postage will begin on May 16, 2011. * works selected for exhibition at Proteus Gowanus will remain on display until mid-July as part of the Paradise exhibition. CURIOUS MATTER is an exhibition venue for contemporary visual art located in downtown Jersey City, NJ. Curious Matter exhibitions and publications evidence the pursuit to understand and articulate our individual and collective experience of the world, real or imagined. We examine fantastic notions, confounding ideas and audacious thoughts. Curious Matter strives to foster dialogue among artists at all career stages with a calendar of regular exhibitions. Our commitment extends to our audience as we endeavor to open a door to appreciating contemporary art in an atmosphere that encourages engagement and curiosity. The gallery is open Sundays noon to 3pm and by appointment during exhibitions. Curious Matter is a non-profit organization, and a sponsored project of Fractured Atlas, a non-profit service organization. PROTEUS GOWANUS is a gallery and reading room located on the Gowanus Canal in Brooklyn, NY. A collaborative project, the gallery develops exhibits of art, artifacts and books and hosts events that revolve around a yearlong theme linking the arts to other disciplines and to the community. Proteus Gowanus incorporates the rich and diverse cultural resources of several non-profit organizations into its exhibits and programming. This year’s theme is PARADISE, an exploration of the light and dark sides of spiritual ascent and sensual escape, in which we invite artists and workers in other disciplines to respond to the siren song of that which is easy to imagine but difficult to attain. There is no fee to enter, and submissions are due on March 4th; Click here for more information. To find out more about Proteus Gowanus gallery, click here; to fine out more about Curious Matter, click here. 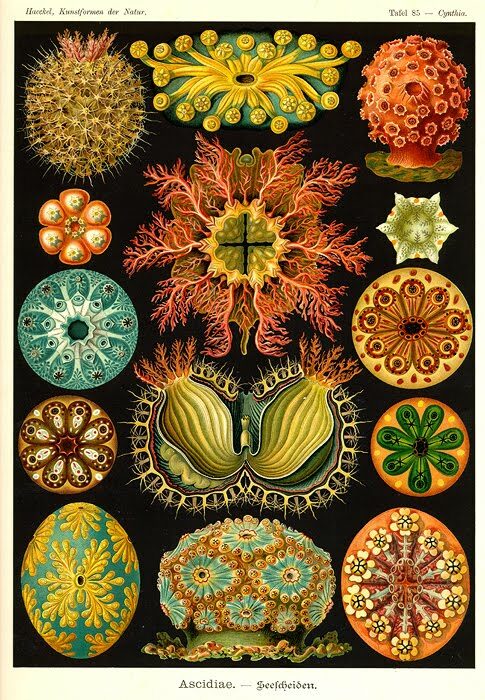 Image: Illustration by artist/naturalist/monist Ernst Haeckel, 19th Century, via zannestars.com.